A Yorkshire housebuilder is remaining loyal to Ripon – and launching a £20,000 Brexit bonus to buyers – as its inaugural scheme in the district proves a sales success. Just two properties remain available on the Corner Farm development on the edge of Copt Hewick – and if buyers sign up before Brexit Day on March 29, they will have all the stamp duty paid for them. That’s the novel “Brexit Benefit” £20,000 pledge announced this week by Burridge Homes, who have breathed new life into the site by demolishing a number of farm buildings and creating five family homes in their place. The collection marks a “home grown” Yorkshire success story Holmfirth-based Burridge Homes, who linked up with local suppliers and contractors – such as the award-winning York Handmade Brick Company, based at Alne – to turn their design plans into reality. The remaining two for sale are both five-bedroom, detached homes priced at £595,000 or £600,000 – with home movers able to benefit from an additional Stamp Duty saving of up to £20,000 if purchased before Brexit. “This exclusive development on the former farmyard at Corner Farm represents more than £2m of investment and enhances one of the main approaches into Copt Hewick,” said David Waddington, director of Land and New Homes at Linley & Simpson. “Previously, it had been dominated by a large agricultural building sitting above Luncarr Lane but these homes now offer a much more attractive welcome. They have been custom-designed to mirror the character of an idyllic North Yorkshire village. 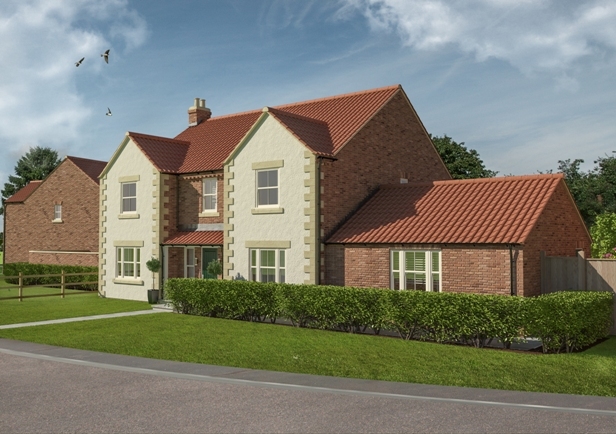 “The Corner Farm development draws upon Copt Hewick’s growing popularity, offering residents the opportunity of rural living whilst only two miles away from Ripon and a similar distance to the A1M.